Workers in the pesticide industry do the important job of mixing, loading and applying pesticides. Like all employees, these workers are entitled to a safe job environment. They are entitled to know the risks of the chemicals they are using and their employers must take appropriate safety precautions to prevent exposing them to hazardous chemicals that could harm their health. Unfortunately, some workers are being exposed to health risks when doing their jobs in the pesticide industry. The Environmental Protection Agency has released a new assessment warning of the dangers associated with chlorpyrifos and has indicated that the agency will take steps to try to diminish the risks that this chemical presents to workers. If you or someone you love was exposed to dangerous pesticides or to any toxic or hazardous chemicals at work, you have certain legal rights. Contact an Atlanta workers' compensation lawyer today to learn how you can make a benefits claim to have your medical treatment expenses and other losses covered. Chlorpyrifos is a chemical that can have an adverse impact on the nervous system. Exposure can lead to confusion, respiratory problems, nausea, dizziness, respiratory paralysis and fatalities. The use of chlorpyrifos in private households has been banned since 2000 with exceptions made for ant bait and roach bait that is sold in child resistant packages. 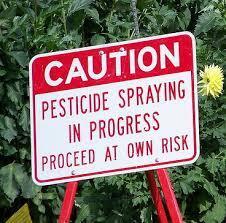 The pesticide was once used on tomatoes, apples, and other crops. However, the EPA took action to limit its use. Chlorpyrifos is no longer permitted to be used on tomatoes and between 2000 and 2002, its use on apples, tree nuts and citrus was restricted. Because the chemical can be very dangerous, the EPA has also instituted "no-sprayzones prohibiting this pesticide from being spayed near to homes, recreational areas and public spaces. Despite these bans, a 2014 human health risk assessment shows that workers are being put at risk of exposure when they work with this pesticide. The pesticide is still widely used around agricultural and other non-residential locations and those who prepare, load and apply it to these areas may be suffering dangerous levels of exposure. The EPA has announced that it is "developing appropriate measures to ensure that workers that use or work around areas treated with chlorpyrifos are protected. If workers do get sick because they are exposed to this pesticide, they should be entitled to make a workers' compensation claim. Making workers' comp claims because of toxic exposure can be challenging as illnesses do not always appear immediately after exposure. This can make it difficult to demonstrate that work duties caused the sickness to develop. A workers' compensation lawyer will help you to show that you got sick because of your job. You are entitled to medical coverage and disability benefits for work-related injuries, so proving your illness is job related is very important to protecting your finances. The Atlanta work injury lawyers at Van Sant Law, LLC have extensive experience with workers' compensation claims. Call today to schedule your free case evaluation if you need help making a workers' compensation claim.